Good afternoon! I hope you're all having a great week so far! When I first saw Karen's Sweet Sunday Sketch #34, I knew exactly what I wanted to do with it. 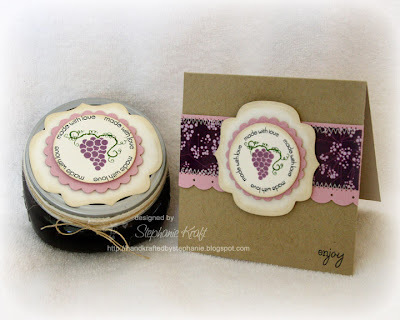 I made some grape jelly that I plan on giving as gifts, and I wanted to make a simple card to go along with it. This sketch was perfect for what I wanted. I kept my card fairly simple so that I could easily produce a few more to go along with the jelly. I used the Papertrey set, Fruitful. I tilted the jar so that you could see the top of it. I wrapped a piece of natural twill around the jar screw band, then I wrapped some twine on top of that a few times and finished it with a simple bow. Accessories: Circle, Scalloped Circle and Labels Nine Nestabilities (Spellbinders), Scallop border punch (EK Success), Twill, Twine, Foam tape, Thread, Sewing machine. this is such a gorgeous set! absolutly love it! !